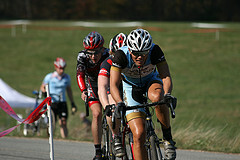 Men's 3/4 leaders. Photo: Joe Metro. Here is the final Tacchino ‘Cross installment. These podium interviews are just what you need to get ready for this weekend’s races. Pre-ride strategy, race tactics, barrier technique, pre-race food. It’s all here. Steevo Cummings (Indiana Regional Medical Center, 2nd Place Men’s Elite): 20-25 minutes is ideal. I ride around the outside of the course and watch the racers when I arrive. I got to pre-ride the course after the Elite Masters with Gerry Pflug. He showed me the lines he was taking, where bottlenecks were forming, where to recover, etc. That was like doing 3 or 4 laps on my own. Some of the stuff I would have not found on my own. Jared Nieters (Haymarket Bicycles/HomeVisit, 3rd Place Men’s Elite): I try to arrive early, during the ‘B’ race, and do the pit work for Tyler Karnes (he does a great job taking care of the task for me during the elite race). After the ‘B’ race, I ride one lap slowly, in my street clothes, and get a good solid look at all of the corners and lines. During the next race I get my number and throw my kit on. Before the women’s race, I typically try to take a lap at a comfortable pace and then another where I hit a few of the trickier corners at speed. Some of the lines I take aren’t the ones that get beaten in during the day (I take early-apex lines more than most people in order to keep exit speeds high), and that becomes more obvious when I’m warming up at speed. I hop on the trainer during the women’s race, and make sure everything is taken care of, before catching the end of the women’s race. Jennifer Maxwell (ATAC Sportswear p/b Bike Rack DC, 2nd Place Women’s Elite): Usually get to the race 2 hours before a UCI race and 1 1/2 for a local. I park, get the LeMond back-up bike ready, and ride to registration. If I can get on the course, I will do a few laps to get a feel for tire pressure and lines to take. I like to sometimes ride behind an Elite women/male to get a feel for which lines to take. HOT laps are for when I am running late and know that I will not get a full hour of warm up on the trainer. So I then register, drop off the LeMond in the pit, and head to the car to warm up on the trainer. I prefer warming up on rollers but with grass and uneven parking venues I need to use the trainer for cross. Tyler Karnes (Pioneer Racing, 1st Place Men’s 3/4): I usually try to arrive at the venue a little over 2 hours before my race, that way I can get out of the car and get straight on course to pre ride a lap before the early race starts. I usually try to get another lap before the last race ahead of mine. This weekend, some unfortunate events in a rider breaking his ankle allowed a lot more course time than usual. I think I got 6-7 laps in before my race, and I re-rode some of the more difficult sections numerous times. I usually walk some of the course on the way to registration, noticing how riders are taking lines and if they are avoiding anything on course. I will get a couple hot laps before my race just as a final warm-up prep. Patrick Blair (Adventures For the Cure, 2nd Place Men’s 3/4): After racing about 13 races this season I think I finally have my pre-race prep figured out! Before the CAT4 race I try to get in at least 2 slow laps, analyzing every aspect of the course. After the CAT4 race I try to get in at least 2 more laps at a faster pace but still taking lots of mental notes on the course layout. During the races before my race I spend time stretching, checking tire pressure, eating, cheering for teammates, etc. Tim Brown (The Bike Rack, 3rd Place Men’s 3/4): I normally like to get in at least 3 laps before racing… an easy lap, a hard lap, and one to work on tricky sections. I usually never arrive early enough to have time to walk the course.